Even as the Rams took care of Divisional Round business against Dallas, DC Wade Phillips’ shaky defense conceded Dak Prescott’s sixth-most yards per attempt (8.3) in 18 starts and got carved for Drew Brees’ fourth-best passer rating (137.0) all year in these clubs’ Week 9 date, a 45-35 Saints home win. Similar to last week’s victory over Philadelphia, Brees diced up Phillips’ secondary with Michael Thomas specifically (12/211/1), who gained 123 of his yards on slot routes and commanded targets on a ball-hoggian 15 of Brees’ 36 attempts. Brees is a marksman at home, where his box-score expectation is well within No. 1 overall fantasy quarterback Patrick Mahomes’ echelon. Across eight Superdome starts, Brees is 208-of-274 (75.9%) passing for 2,552 yards (9.31 YPA), 23 touchdowns, and two picks, good for a 27.2-point average in fantasy passing points. Including playoffs, Mahomes’ average is just shy of 26.9 passing points per game. Alvin Kamara is the Saints’ clear feature back in close games, a trend that held in New Orleans’ Divisional Round comeback win over Philadelphia. Kamara out-touched Mark Ingram 20 to 11, out-snapped him 69% to 39%, and out-targeted Ingram 4 to 2. Kamara has out-touched Ingram 90 to 60 in one-score games with both backs active. Rams-Saints projects as a one-score game with New Orleans favored by 3.0-3.5 points. … Although Phillips’ front seven deserves credit for stymieing Ezekiel Elliott on the ground (20/47/1) last week, keep in mind Dallas’ injury-ruined interior offensive line is far worse than the Saints’, and the Rams entered the Divisional Round having yielded 100-plus rushing yards in each of their previous five games. Kamara ethered L.A. for 116 yards and three TDs in these teams’ Week 9 meeting. Ingram was held to 36 scoreless yards on ten touches. … Past meetings and sportsbook spreads notwithstanding, I think the Saints at home have enough matchup advantages to impose their offensive will, contain the Rams’ run game, turn them into a Jared Goff-reliant team, and cover as a two-score winner. This scenario would position Ingram to beat expectations and make him playable alongside Kamara in the same DFS lineups. Brees’ target distribution in his last two starts (Weeks 16 & 19): Michael Thomas 29; Ted Ginn 15; Kamara 10; Keith Kirkwood and Josh Hill 6; Ingram 4; Ben Watson 3; Tre’Quan Smith 2. … The Rams have stayed vulnerable on the perimeter despite Aqib Talib’s return, permitting at- or above-expectation results to Alshon Jeffery (8/160/0), Michael Gallup (6/119/0), Amari Cooper (6/65/1), Trent Sherfield (6/62/0), and Kendrick Bourne (5/59/1) in their last four games. Thomas led the Saints in Weeks 16 and 19 outside routes (55) with Ginn second (37). … Thomas’ Week 9 whipping boy was Marcus Peters, who also got taken to task by Gallup last week. PFF credited Thomas with the NFL’s ninth-most yards on slot targets (577) this season, where Thomas (6’3/212) has a colossal size advantage on Rams slot CB Nickell Robey-Coleman (5’7/169). Slot routes increase Thomas’ chances of avoiding Talib, who aligned inside on just 4% of his 2018 snaps. As Brees plays much better at home, it follows that Thomas’ average Superdome receiving line (8.9/110.3/0.8) is far superior to his road-game average (7.1/72.9/0.4). … Ginn just missed a monster Divisional Round; Brees narrowly underthrew him on would-be 80-yard TD bomb, then missed Ginn on an end-zone target. Still, Ginn has been a big part of the Saints’ passing attack with 8 and 7 targets in two games since returning from I.R. and remains firmly in DFS play. … Although the Saints rarely call plays to feed him, slot WR Kirkwood ran more Week 19 routes (33) than Ginn (28) and scored his third touchdown of the season from two yards out. Even more so than Thomas, Kirkwood (6’3/221) towers over Robey-Coleman and should see the field for over half of New Orleans’ offensive snaps. … Hill led Saints tight ends in Week 19 playing time (64%), routes (20), and targets (3) over Watson (32%, 16, 1) and blocker Garrett Griffin (20%, 2, 0) as Dan Arnold was a healthy scratch. Hill also played his most snaps all season (78%) against the Rams in Week 9. As Jared Goff struggled with accuracy, footwork, and confidence down the stretch, the Rams morphed into a run-heavy team with a 131:81 run-pass ratio in Weeks 16-19 and 40-plus rushing attempts in each of their last three games. In eight career starts without Cooper Kupp (ACL), Goff has averaged 22.6 fewer yards, 1.3 fewer yards per attempt, and 0.31 more interceptions per game. Goff’s tendency to hold onto the ball in the pocket is another concern against a Saints defense that finished No. 5 in sacks, No. 9 in QB hits, and No. 5 in QB pressures in home games. Goff ranked 28th among 38 qualified quarterbacks in PFF’s under-pressure passer rating (59.8) – averaging 3.5 fewer yards per attempt under duress than when kept clean – and appears incapable of trading blows with Brees in a back-and-forth shootout. Goff’s YPA also dipped from 8.8 with a 22:3 TD-to-INT ratio at home to 7.6 with ten touchdowns and nine picks on the road. Goff has cleared 220 yards just once in six games since the Rams’ Week 12 bye, at times looking like a shell-shocked player who needs everything around him to be perfect to succeed. Sean McVay’s stretch-run play calling has been indicative of a coach trying to “hide” his quarterback rather than feature him. The Rams’ Divisional Round game plan was as smashmouth as it gets, punishing road-tripping Dallas for a dominant 48/273/3 (5.7 YPC) rushing line with twin 100-plus-yard runners. Now on the road facing Football Outsiders’ No. 3 DVOA-rated run defense, reenacting last week’s strategy will be exceptionally tough. Run-game elimination is among the Saints’ primary strengths, holding enemy backs to a 131/380/1 (2.90 YPC) rushing line over their last seven games and the NFL’s second-fewest yards per carry (3.98) when opponents use three-receiver 11 personnel, a package in which the Rams call 83% of their run plays. Although DT Sheldon Rankins’ (Achilles’) loss stings, David Onyemata, Tyeler Davison, and Taylor Stallworth are all stud run stoppers, and Pro Bowl LE Cameron Jordan often kicks inside. Whereas C.J. Anderson sets up as a DFS fade, Todd Gurley’s usage should spike if the Rams fall behind. Gurley ran 20 pass routes to Anderson’s five last week and was as explosive as ever, averaging a season-high 12.1 MPH on his carries and reaching 15 MPH on a season-high six rushing attempts. Goff’s post-Kupp target distribution: Robert Woods 73; Brandin Cooks 63; Josh Reynolds 51; Gurley 42; Gerald Everett 34; Tyler Higbee 22; Anderson 7. … Woods is the Rams’ highest-floor play after leading the team in Week 9 targets against the Saints (9), then repeating in Week 19 targets (8) and catches (6). The Eagles’ biggest Divisional Round mistake was not attacking Saints slot CB P.J. Williams after Williams gave up 25-of-33 targets (76%) for 292 yards (8.85 YPA), three touchdowns, and zero interceptions over New Orleans’ last seven games. Woods runs 78% of his routes in the slot. … Ex-Saint Cooks made good on his Week 9 revenge game, dusting a variety of Saints DBs for 6/114/1 receiving on eight targets. As a smallish 4.33 speedster, Cooks has Hiltonian dome-game splits with a 0.53-touchdown average indoors versus 0.40 outside. … If McVay is smart – spoiler alert: he is – he will use Reynolds to occupy Saints top CB Marshon Lattimore while Woods, Cooks, and Gurley eat. Reynolds’ usage lacks consistency on weekly target counts of 4 – 7 – 2 – 12 – 7 – 5 – 8 since Kupp tore his ACL, but Reynolds has played over 87% of the offensive snaps in six of the last seven games, locking him into a stable role at his affordable DFS price. … The Rams went back to Higbee as their primary Week 19 tight end, likely due to his superior blocking in a run-first game. Zero catches since Week 16 may push Everett off most DFS radars, but his routes run and targets could easily rebound if the Rams are forced to chase points. Even with game-script-dependent usage and just one reception longer than nine yards since Week 11, Everett needs to stay on the DFS-tournament radar as a fade-recency-bias play with high-end athleticism in a projected shootout. Albeit not quite the “Arctic Blast” feared early in the week, Sunday night’s Kansas City forecast calls for sub-30-degree temperatures but insignificant winds and precipitation. Patrick Mahomes made his coldest college start in 38-degree weather at Iowa State in 2016, and he played his coldest game this season at 27 degrees in Week 16 against the Ravens. With small-ish hands (9 ¼”) and limited experience in the cold, Mahomes logged his fewest (6.8) and fourth-fewest (7.1) yards per attempt in his only two 2018 starts of 30 degrees or lower. Additionally, this game’s total has dropped by 2.5-3.0 points after opening at 58.5. … After averaging 9.3 yards per attempt with a 9.5% touchdown rate in Weeks 1-11, Mahomes regressed to 7.60 YPA with a 5.7% TD rate in six starts following Kansas City’s Week 12 bye. The Chiefs’ offense continued to hum – averaging 31.8 points per game with a low of 27 – but Mahomes simply wasn’t as dominant in Weeks 13-19. He now faces a Pats defense whose strength is its lockdown secondary after allowing the NFL’s seventh-fewest yards per attempt (6.5) and seventh-lowest passer rating (84.0). Aided by the elements, Bill Belichick’s likeliest game plan will be to try to keep Mahomes confined to the pocket, fool him on fake blitzes where defenders drop into coverage, focus on big-play limitation by halting Mahomes’ improvisational rollout bombs, and make concessions on the ground. Damien Williams would be positioned to capitalize in said scenario much as Kareem Hunt has; Williams’ predecessor dusted New England for touches/yards/TD results of 15/185/1 and 22/246/3 in these clubs’ 2017 and 2018 dates, including Hunt’s otherworldly receiving lines of 5/98/2 and 5/105/1. Williams is averaging five targets per game since taking over as Kansas City’s feature back in Week 15, while the Pats were bum rushed for 167/853/5 (5.11 YPC) rushing by enemy backs over their last nine games. As Williams set season highs in snaps (77%), routes (28), and touches (30) in last week’s Colts trampling, No. 2 back Darrel Williams managed three touches, and Spencer Ware (hamstring) remained a scratch. Even if Ware finally plays – he hasn’t since Week 14 – Damien has more than earned every-down work in this plum draw. Mahomes’ Week 19 target distribution: Tyreek Hill 13; Travis Kelce 10; Sammy Watkins 8; Williams 6; Chris Conley 1. … The Patriots had no answers for Hill in either of their 2017 and 2018 meetings, getting burned for receiving lines of 7/133/1 and 7/142/3. Leaning on Devin McCourty and Jason McCourty to guard Hill in Week 6 flatly did not work. With 90-plus total yards and/or a touchdown in four of his last five games, Hill is neck and neck with Michael Thomas as Week 20’s highest-ceiling DFS receiver play. Hill has specifically obliterated press-man coverage for a league-best 4.1 yards per route run, notable since New England is a press-man team. … The Pats checked Kelce on stat lines of 5/61/0 – 5/40/0 – 6/23/0 in their last three meetings, roughing him up in Week 6 with chips from edge defenders and linebacker-safety double teams. Kansas City scored 40 points, however, so a game-plan change wouldn’t be surprising. New England played middling tight end defense this season, finishing 15th in yards per game allowed to Kelce’s position (51.3). … Beyond a potentially rust-induced drop and fumble stripped by stud Colts rookie LB Darius Leonard, Watkins looked 100% in his Divisional Round return. Watkins got lost in Stephon Gilmore’s Week 6 coverage, though, and his five career stat lines against the Pats are 2/18/0 – 3/39/0 – 6/60/1 – 3/57/0 – 2/27/0. Watkins has done his best work against zone; New England leads the NFL in man-coverage rate. … Conley remained Kansas City’s No. 3 wideout in the Divisional Round, drawing only one target but running 35 routes on 66% of the snaps. 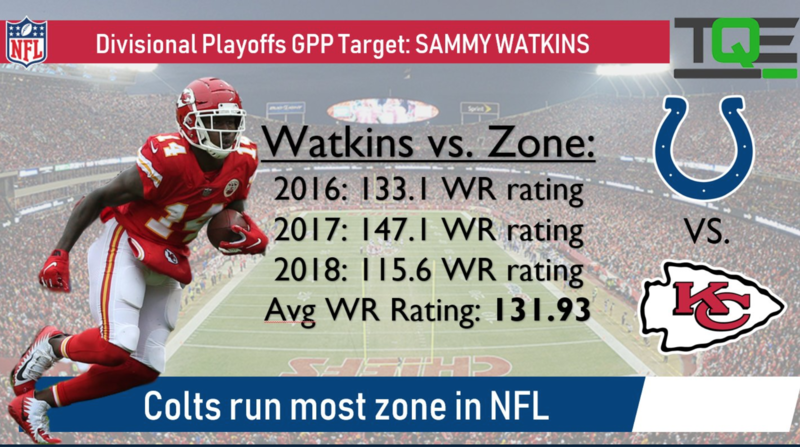 Despite heavy playing time, Conley has failed to top 25 yards in all of Watkins’ ten full games and is always a DFS punt with a goose-egg floor. The Chiefs and Patriots both had notable 2018 home-away splits that spilled into last week’s Divisional Round with New England melting the Chargers in Foxboro and Kansas City making quick at-home work of the Colts. The Chiefs allow just 17.4 points per game at Arrowhead compared to 34.3 PPG on the road, while the Patriots are 3-5 averaging 21.6 points in away games versus 9-0 with a 33.8-point average at home. As Kansas City has generated league highs in sacks (55) and QB pressures at home (118) yet allows a crisp 5.00 yards per carry and the NFL’s seventh-most receiving yards per game (52.6) to running backs, a game plan mirroring last week’s featuring James White on quick passes and Sony Michel on the ground seems optimal. Coming off a ridiculous 15-catch Divisional Round, White’s 35 routes run were his most since Week 8, and he is the Pats’ least game-script-dependent back with stable DFS upside should they fall behind. … Michel’s floor is always low, but he is averaging 18.7 touches since New England’s Week 11 bye and will be positioned for another monster game should the Patriots grab a lead. New England’s trench-war advantage is gargantuan, ranking No. 3 in Football Outsiders’ Adjusted Line Yards. The Chiefs’ defensive line ranks dead last in Adjusted Line Yards allowed. … Rex Burkhead chipped in a six-yard touchdown run in last week’s second quarter but managed five touches on 11 snaps and remains the clear third wheel. Tom Brady visits Arrowhead on a quiet but tangible roll, completing 167-of-243 throws (68.7%) for 1,950 yards (8.02 YPA) and a 13:4 TD-to-INT ratio since New England’s Week 11 bye. Brady picked apart Kansas City on play-action passes when these clubs met in Week 6, completing a season-high ten such throws for 140 of his 340 yards. 30 points may be the Patriots’ AFCCG magic number; Kansas City has gone 34 straight home games without allowing 30, and this year’s Patriots are 7-1 when scoring 30 or more, their lone loss occurring on Week 14’s Miami Miracle consisting of desperation last-play laterals. In addition to pounding Michel for 24/106/2 rushing, the Pats’ Week 6 formula for outscoring the Chiefs involved Brady getting rid of the ball quickly; Tom Terrific’s average of 2.31 seconds to attempt was sixth fastest in the NFL that week and quicker than his season average (2.43). Kansas City’s coverage approach combines man on the outside with zone on the interior, where White can continue to eat and Julian Edelman is set up for another big game on quick-option routes and shallow crossers. After torturing the Bolts for 9/151/0 on 13 targets, Julian Edelman enters conference title week with six-plus catches and/or a touchdown in 12 of his last 13 games, plus stat lines of 4/54/1 and 10/100/0 in his last two K.C. meetings. Edelman’s game perfectly fits the aforementioned quick-passing approach, while PFF charged Chiefs slot CB Kendall Fuller with 19-of-23 targets allowed (83%) for 206 yards (8.96 YPA) over his last three games. Edelman runs 67% of his routes inside. … Beginning with most recent, Rob Gronkowski’s target counts are 1 – 2 – 3 – 5 over the last month. He’s cleared 60 yards once since Week 6. It’s fair to suggest Gronk is a better blocker than pass catcher at this stage of his career. Kansas City yields the NFL’s fifth-most receiving yards per game (65.8) to tight ends, however, and Gronk’s DFS cost has dipped to a range where he’s worth tournament consideration based on matchup and shootout possibilities. Playing Gronkowski at a lower price than Kelce would create a massive DFS edge in the admittedly-unlikely event Gronk scores more fantasy points. … Chris Hogan’s five Week 19 targets and season-high 44 routes run keep him in DFS play, but it’s no secret Brady and Hogan have lacked chemistry all year. Hogan’s ten red-zone targets rank third on the team, yet just one has hit pay dirt. Ultimately, Hogan is a hope- and matchup-based play after the Chiefs allowed the NFL’s fifth-most yards per game to wideouts this season (170.6), including 78 yards to Hogan in Week 6. … Phillip Dorsett remained the Patriots’ clear No. 3 receiver last week, running 27 routes to Hogan and Edelman’s 44 yet once again outproducing Hogan. Even as a situational player, Dorsett’s speed and versatility keep him playable against a Chiefs secondary that has allowed a league-high 68 completions of 20-plus yards.